You know we hate the yellow kitchen… And quite honestly, it has been on the top of our to-do list since the day we moved in but it quickly (due to the sudden realization of complexity) was moved to the back of the line. Being first time home owners and having never remodeled a kitchen before in our lives, we had no idea what kind of $$$$ we were in for. So we sort of took it in stride. At first it seemed pretty simple, right? Just knock out the current cabinets and replace them. Easy as pie. But noooooo, with a bit of research that bubble was quickly burst. We figured the first thing we had to do to get a rough idea of pricing was to come up with a design. So it was off to Home Depot for an appointment with their kitchen designer. We figured they’d have a bit more experience than we did. We were right. Our designer wasn’t phased one bit by our requests. She heard us out, gave a couple of recommendations, and boom! We had a kitchen. Sort of. Now at first glance you may be asking yourself, BROWN?!?! Why brown!? I thought you were dreaming of a white kitchen?! To you I say… you’re right. We originally wanted to avoid white cabinets because we both grew up with builder grade kitchens that utilized white cabinets and it left a sort of “cookie cutter” taste in our mouths. So brown it was… for now. After our initial excitement we asked what kind of price we were looking at. And that is when our eyes bugged out and we went running for the door. Sort of. 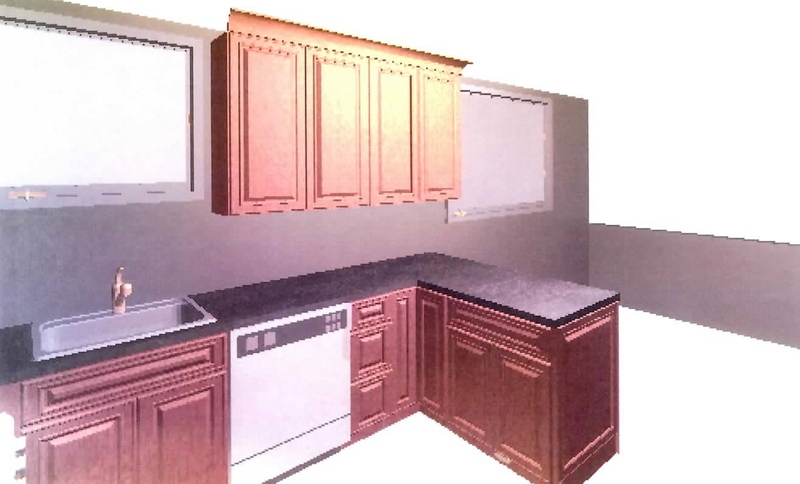 $10,000 for cabinets alone. Granted we were looking at Thomasville which apparently (unbeknownst to us) is a (so-called) top of the line brand. Even when we spec’d it out with a lower cost brand it was about $7,500. Still pricey. And that doesn’t include the counter top, hardware, sink, floor, drywall repair, electicians and plumbers… oh boy. We need to start saving. 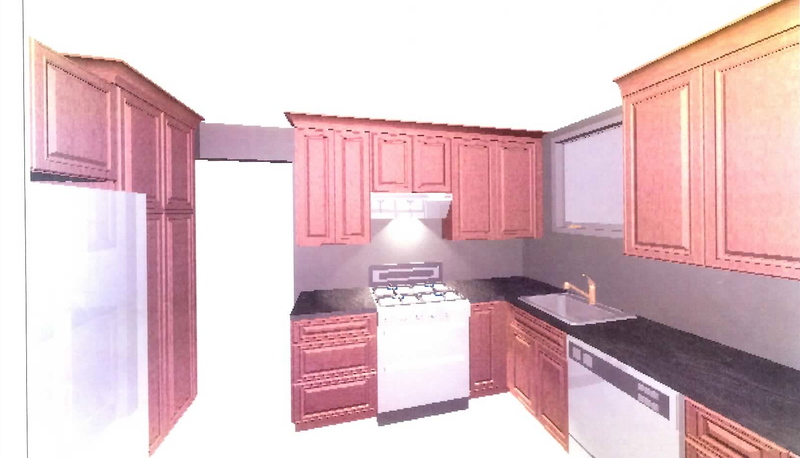 why don’t you just paint the cabinets, install a new counter, sink and back splash? 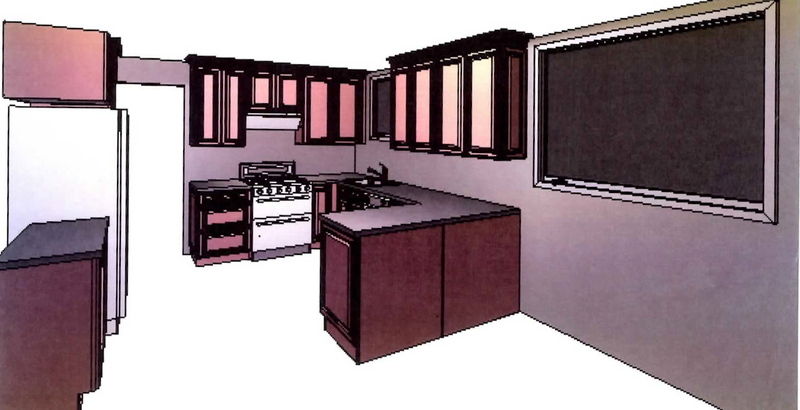 Less costly, and in the meantime you can save for the dream kitchen! Thanks Valerie! That’s something we have talked about quite a bit. Unfortunately our cabinets are not in the best shape (think old cheap 60’s builder cabinets used for the past 50 years) so we decided we didn’t really want to put money into them. 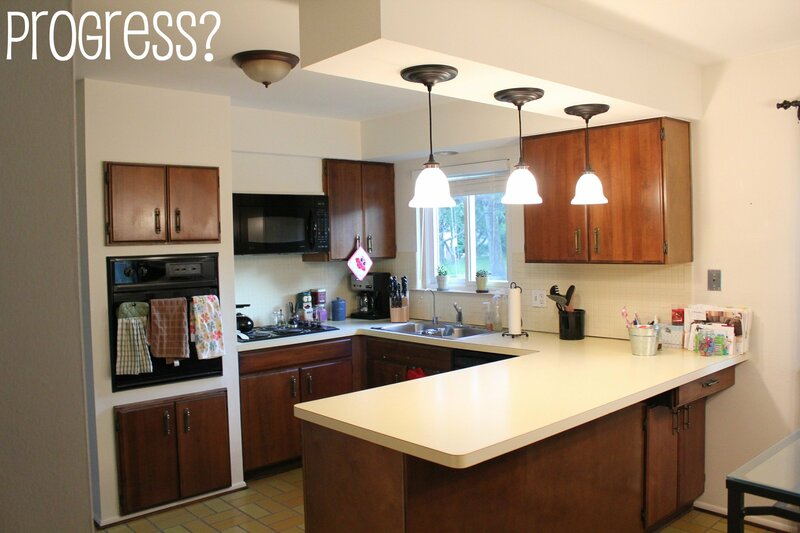 But, we did find a feasible and cheaper way to redo cabinets and all; that post is coming soon!